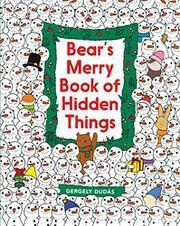 A little bear gets ready for a Christmas party by searching for 22 hidden items in this seek-and-find offering. Bear needs lots of supplies for his party, especially decorations and sweet treats for his guests. The small, brown bear appears at the bottom of each spread with two or three lines of text per page describing his current search and inviting readers to participate. Bear looks for a horn at a Christmas market, an unwrapped box in a pile of presents, and a Christmas stocking in a messy mix-up of mittens. Decoration searches include a wreath hidden at a Christmas-tree lot, holly leaves secreted among green garlands, and a treetop star concealed in a field of foxes. All 22 special items appear in use at the concluding party scene, along with animal friends that have appeared within previous searches. Detailed illustrations in candy-bright colors offer cleverly concealed quests that require quite a bit of concentration to solve, and younger children may need assistance from caregivers to find all the items. A somewhat ungainly title and an overly busy cover design are not as appealing as the inside pages that depict Bear’s searches and party scene.